Egyptian security forces are digging deeper into their budget with each volley of increasingly fatal US-made tear gas they launch at demonstrators. The human cost of the violent crackdown in central Cairo is increasingly clear -- among the 39 fatalities reported to date, several are said to have died of asphyxiation caused by tear gas. But the financial background to the use of crowd control weapons raises questions about the extent of Washington's financial assistance to Egypt's military and how this might filter down to the ministry of interior. The USA is the biggest arms supplier to Egypt, providing an average of US$1.3 billion in military and law equipment every year since 2000. Records from the US Department of State show the US supplied $1.7 million of "toxicological agents" -- "including tear gases and riot control agents" -- to Egypt in 2010. This was the largest dispatch of such agents in at least 10 years. In 2009, the US supplied 33,000 units of 'tear gas and riot control agents' worth $460,000. It did not supply in 2007 nor 2008, but gave 17,000 units worth $240,000 in 2006, documents show. This assistance, however, was granted to the military, and it is not clear whether it was then channelled to the ministry of interior. The Central Security Forces (CSF), Egypt’s riot control machine, is a division within the Ministry of Interior, but is closely tied to the armed forces, as its troops are conscripted through the military then transferred to CSF. "The military’s arming includes tear gas and riot control weapons. The ministry of interior supposedly buys its own weaponry through other channels," Mahmoud Kotri, a retired brigadier general who wrote a book suggesting radical police reforms, told Ahram Online. Kotri confirmed that when the current minister of interior, Mansour El-Essawy, was appointed in March he issued explicit instructions to CSF not to carry live ammunition when confronting protesters. This directive apparently included a ban on shotguns. Kotra explained these weapons were formerly used to fire tear gas canisters via an ad-hoc launcher. El-Essawy’s instructions probably forced CSF to acquire new types of gas bombs and new ways of launching them, says Kotri. Nevertheless, doctors on Tahrir Square treating the injured say they have seen many protesters hit by live ammunition, including shotgun wounds. "No MOI official in his right mind would order the use of live ammunition. Not after what happened in January and the former security leadership currently on trial for killing protesters -- it just doesn’t add up," he says. Protesters and medical staff in Cairo have also expressed concern about the kind of gas being deployed by security forces. Speaking to Ahram Online at the field hospital in Qasr El-Dobara church behind Tahrir Square on Monday night, volunteer doctor Lilian Sobhy said their improvised clinic had seen 290 patients in 24 hours, the majority with breathing problems. "Some in contact with the gas are suffering from a severe burning sensation in the lungs," Sobhy said. "This is not normal gas and these are not normal symptoms." Others, however, claim the symptoms -- serious though they are -- are no different from those caused by extreme exposure to CS gas in the past. A former police officer told Ahram Online a colleague of his in the CSF was exposed to tear gas used by Egyptian border guards on Palestinians who broke through Rafah crossing in 2008. He said the army's gas was “unbearable and different from that used by CSF”. Given the impressions above, many questions arise. Is this a new kind of gas? If so, what is its nature? Is it designed use on civilians or is it a much more powerful assault tool used for military purposes? Who provided such weapons to the CSF? Was it the army, or did it get them through other channels? For its part, the Armed Forced issued Communiqué’ no. 83 on their official Facebook page denying that it had used “gases” on protesters. The 2010 supply of “Toxicological Agents, Including Chemical Agents, Biological Agents, and Associated Equipment”, which includes tear gas from the United States, which came under the auspices of 'foreign defence assistance', comprised 94,000 unspecified units. Figures suggest the vast majority of these 'units' were tear gas canisters. A crude calculation, made by dividing the aid sum by the number of units, shows the cost of a single tear gas canister may be around $18. Other, much-higher, figures have also been touted. On Wednesday night, Amr El-Leithy, a prominent TV anchor, estimated the price of a single canister at $48, but did not give a source for this figure. Eyewitnesses on the frontline in Cairo have reported hundreds of volleys of tear gas in the six days since the crackdown began. Canisters found on the battle-scarred streets around Tahrir Square bear the manufacturing stamp of Combined Systems Inc (CSI), a US-based firm that provides equipment to military forces and law enforcement agencies around the world. Among CSI's investors is the Carlyle Group -- an asset management firm which once counted former US President George Bush Snr among its advisors. CSI produces its ‘riot control devices’ under its law enforcement brand name, Combined Tactical Systems (CTS), a firm headquartered in Jamestown, Pennsylvania. CTS's website -- www.less-lethal.com -- displays what it calls the company's "full line of chemical irritant and smoke munitions". A catalogue on the company's website displays the latest devices, but the dates of manufacture and design of some of the canisters show Egypt's Central Security Forces are using older, often-expired versions. Instructions on gas canisters say they should not be used after expiry, which is five years after the manufacturing date. 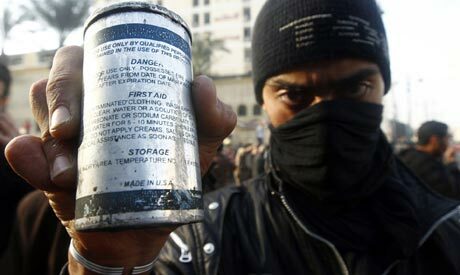 Some cans found near Tahrir have a manufacture date of 2001. The Minister of Interior has admitted using expired canisters but said this only means that they would be "less effective." All the canisters above unleash CS gas -- a standard riot control agent -- but CTS also makes canisters that use CN gas, a more toxic formulation that takes longer to disperse and can cause disorientation and fainting. Other media have reported finding CR gas canisters around Tahrir -- an agent that medical experts say can cause pulmonary, heart and lung problems among those subjected to intense exposure. CR gas is banned for military use under the Paris Convention on Chemical Warfare of 1993 but several governments still use it against their own people and, allegedly, those under their military occupation. These governments include the United States, Sri Lanka and Israel, as well as Egypt. Gas manufacturer CTS has been linked with the 'non-lethal' weapons used by Israeli forces that have been unleashed on Palestinian protesters, reportedly causing several deaths due to asphyxiation. Its supply to the Israeli market might suggest why several canisters found in Cairo with CTS numbers and designs also have Hebrew markings. I'm talking about the purchaser, that is if you are addressing me. But I really respect your views. if everytime you wear,eat or use a chinese product makes you a communist , then God help you. the manufacturer is not responsible for the use of it's product, if not all the knives factories would be in trouble. As I have said, this is madness, but who is responsible [Mr Tantawi? ]: "Demonstrators have gathered three common types of gas canister with the following serial numbers and catalogue descriptions: #4230 - CS Smoke #6230 - CS Smoke - marketed as an 'outdoor grenade' #3321 - Long-range CS Smoke - effective for 137 metres"
Combined Tactical Systems, the company that manufactured most or all of the gas canisters fired at Tahrir, routinely flies the Israeli flag, alongside the US flag, at its Jamestown, Pennsylvania, headquarters. See the pictures at http://mondoweiss.net/2011/01/party-building-on-fire-shots-fired-at-demonstrators-army-pouring-into-streets.html and http://endtheoccupation.org/article.php?id=2915 (scroll down a bit).